Bought this thing a while ago with plans to fix it up. Quite a few parts broken/missing. Replaced everything but one of the things missing was the trans. Didnt really think about it and I ordered a regular little trans thinking it would work. It does, But it runs the bike in reverse. Not a huge loss, only $30 and may be useful later down the line in other projects so not all is lost. Any body have an idea what trans I actually need or if any are even available anymore? Maybe somebody could sell me one? Would hate for the little thing to go to waste because I cant find a trans it needs. 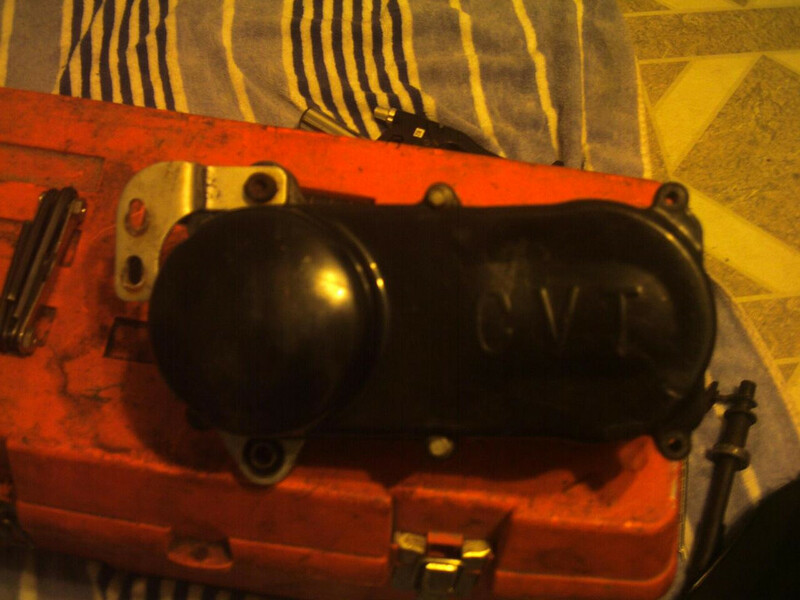 Ive tried to read up and I see theres different ones, CVT and regular but I hear the CVT is a pain to install. Really not interested in the CVT if its avoidable. Thoughts? 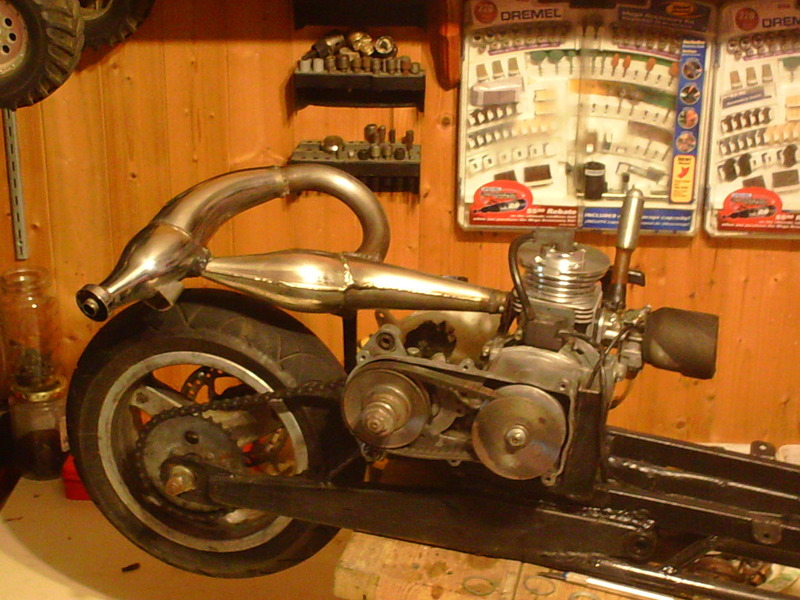 I know the plastics say X1 but that engine is mounted all the way forwards and it has a TF-8mm chain...….X1's come with a bicycle type chain. Does the exhaust pipe have an expansion chamber? Last edited by CAM2; 3 Weeks Ago at 09:31 PM. Thanks for the reply. Any chance you could link me to one? Im not having any luck finding any, unless im searching wrong. Only ones i find are CVT ones for over $1,000. Lol. Edit: Yeah i couldnt figure out why it said X1 but didnt seem to be an X1. Still the same problem as above. Guess I'll have to message the seller for a reasonable price. And no, no expansion chamber. Just a pipe from the engine to the muffler. Really, really loud though for some reason. Makes you a little deaf when youre near it. No clue why, muffler inards must be rotted or something. Last edited by CAM2; 3 Weeks Ago at 09:57 PM. Thats a sick pipe! I sent the seller on ebay a message, hopefully they'll respond with a price and not that they are out of stock or something. I see a lot of sellers put an insane price on things when theyre out of stock to hold the listing up for some reason. Last edited by CAM2; 3 Weeks Ago at 10:22 PM. I remember reading about that somewhere. No more 2 strokes due to al gore or something lol. All I'm able to find/buy is 4 strokes now. 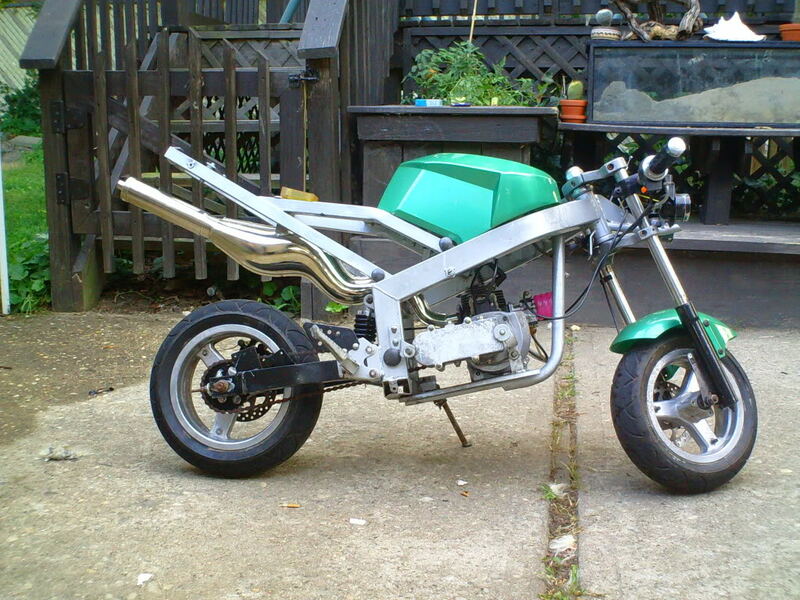 Why they thought it was a good idea to ban 2 stroke mini bikes is beyond me. Most garden tools are 2 stroke and half of them use close to the same, if not the exact same motor these do. People put chainsaw motors on these bikes does the re-purposing of the engine make it illegal??? Seems like a direct attack on the bikes only. Its mainly AlGores agenda....Its like Apple....They start a chatroom then the hackers gloat about finding security vulnerabilities and the Apple techs who monitor the site get right on working on an update patch fix on the quickness..
Last edited by CAM2; 3 Weeks Ago at 10:56 PM. you talking about the Nuts on eBay, for $999.99, their Crazy. I email them a month ago about why they were selling $80 transmission for $1,000, never heard from them, wow, I wonder why, lol. I just sold a new CVT trans for $80 that's what they cost. Hard to find one now. I would search, pocket bike parts direct from China, on the .com banggood and aliexpress and see if you can find one there. I would contact there sellers that have transmission for for sale, and ask if the can find you an X1, a CVT trans for an X2, which ever you need. Last edited by EPR; 3 Weeks Ago at 11:09 PM. .. "sorry we don't have that item any longer"
Yeah, I've searched the internet for hours. Nobody seems to have them. Checked every single pocket bike website, even the scammy ones. Tried banggood and ali, nothing. I even went back to the guy I bought it from and he said he doesnt have the parts. I messaged 3 sellers on ebay, 1 got back saying theyre out of stock and they put an insane price on it to keep the listing up like I said they do higher up the thread. They said they'll be in stock in a few weeks and lower the price, but I doubt it. The last time that seller sold one was in April 2016. And if that seller can get them, whos making them and selling them to this single ebay seller and nobody else on the planet??? Seems fake. Think I'm totally out of options. If anyone has one I'm more than willing to work out a deal for it. The other day we lost another supplier which was Fancy Scooters..Its now labeled as "Permanently Closed"...If anyone was gonna have one or be able to get one it would be them.. I have another option too but i'd have to PM them to see if theyre able to still help as they were at one time a huge supplier of pb parts. 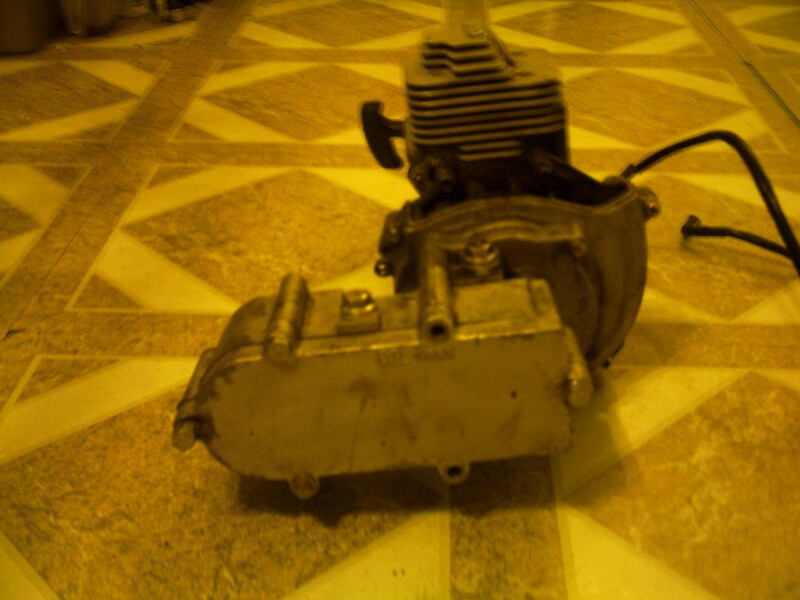 Your other choice in all of this is to flip the engine and rear tire 180* and use what you have..
Last edited by CAM2; 3 Weeks Ago at 02:21 PM. Also, look for another X1 with good trans.